← THROW OUT DETROIT’S EM! POWER TO THE PEOPLE, NOT THE BANKS! Major federal lawsuit against new EM Act 436 filed March 28 as protesters march, occupy Coleman A. Young Municipal Centr. 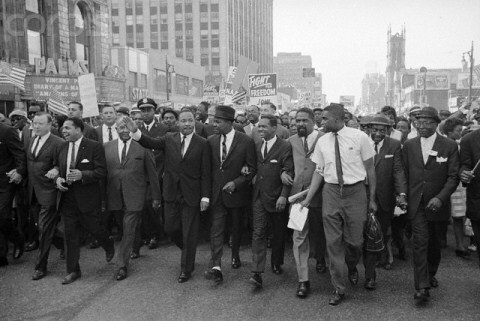 Dr. Martin Luther King leads freedom march in Detroit, 1963. It was the first time he gave his “I Have a Dream” speech. DETROIT – Detroit’s City Council has one last chance to stand up for the people against the bankers’ seizure of the country’s largest and poorest Black majority city March 25. They blew earlier chances nearly a year ago April 4, 2012, the anniversary of Dr. Martin Luther King’s assassination, with the 5-4 passage of a disastrous consent agreement. Most recently the Council failed to pursue its legal right to challenge Michigan Gov. Rick Snyder’s appointment of Emergency Manager Kevyn Orr in court. 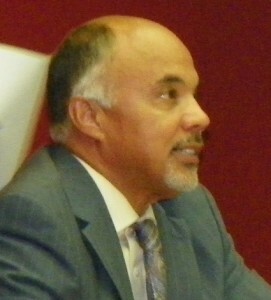 Now, Council President Pro-Tem Gary Brown is pushing for the Council to approve a contract with Orr’s previous employer, the Jones Day law firm, according to inside sources. He wants the Council to vote Tuesday, April 2 at its regular session, but the vote may be delayed until April 9. Snyder and Detroit Mayor Dave Bing tapped Jones Day, the world’s third largest law firm, to become the city’s “re-structuring counsel” under newly-minted Public Act 436. Orr worked for the firm from 1984 until his alleged resignation to take over as EM. “I look forward to meeting [Orr] sometime today and talking about . . . how do we reduce crime in the city of Detroit,” Brown told WWJ radio March 25, the day Orr took office in the Coleman A. Young Center next to Detroit Mayor Dave Bing. Bing refused to fight the EM appointment. Orr’s spokeman is William Nowling, a former campaign aide to Snyder. Brown did not address what may be the biggest crime in Detroit’s history. That crime will reap huge profits for Jones Day and its client banks, which hold most of the City of Detroit’s $16.9 billion debt, a key factor cited in the takeover. These include UBS AG, which just paid a $1.5 billion fine to the U.S. Department of Justice for interest-rate rigging, Citigroup, which just settled another lawsuit brought by cities and pension funds for $730 million, Goldman Sachs, Bank of America’s Merrill Lynch, and Muriel Siebert and Co., an affiliate of the SBS Financial Group. Their role is confirmed by debt documents obtained through a Freedom of Information Act request by the Moratorium NOW! Coalition, and postings on the Jones Day website. Most of the banks are also defendants in lawsuits world-wide brought by cities, states and investors, which claim they manipulated the “London Interbank-Offered Rate” (LIBOR), to increase their profits while defrauding public and private investors. It is estimated that $800 to $1000 TRILLION worth of securities and loans were affected. “A lawyer shall not represent a client if the representation of that client will be directly adverse to another client . . .” say the Michigan Rules of Professional Conduct, section 1.7(a), Conflict of Interest. 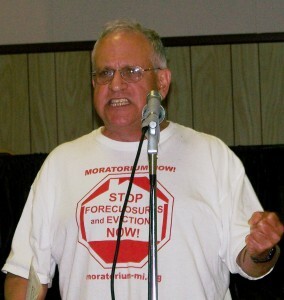 Attorney Jerome Goldberg of The Moratorium NOW Coalition Against Foreclosures, Evictions, and Utility Shut-offs earlier said that the role of Jones Day clients in Detroit’s economic collapse is indeed “directly adverse” to that of Detroit’s people. Goldberg said that money should be spent instead on the people of Detroit, including jobs, affordable housing, street lighting and other services. He called for the city to declare a moratorium on its debt payments, an action which working and poor people across the globe have demanded, protesting by the millions, as banks exact draconian austerity measures. Over 200 protesters then marched on the federal court building in downtown Detroit, and occupied the Coleman A. Young Municipal Center for two hours demanding to meeting with Orr. 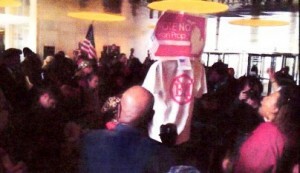 Protesters jam CAYMC lobby March 28, 2013. “We are fighting for our children, we shall not be moved, just like a tree that’s standing b the water, we shall not be moved,” the occupiers sang. Sharpton promised that thousands more will descend on the city after NAN’s national conference next week. 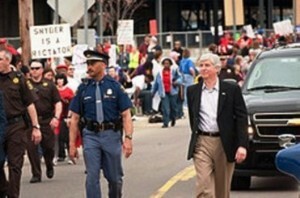 Protesters call Synder a dictator in Benton Harbor, during annual parade. Meanwhile, Gov. Snyder and Wall Street ratings agencies celebrated the takeover. Snyder and Dillon met with all three ratings agencies in New York the previous week, according to the release. 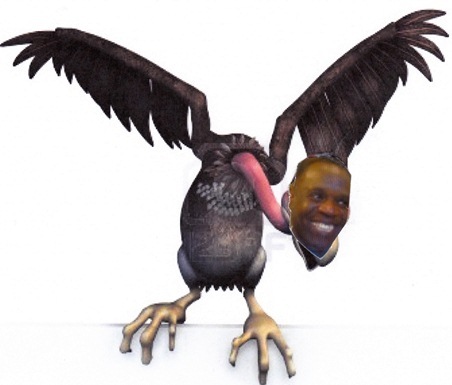 Detroit EM Kevyn Orr is waiting to dine on Detroit’s assets. Standard and Poor’s, which is facing a $5 billion fraud lawsuit by the U.S. Department of Justice, chimed in earlier. “The appointment of an (emergency manager) allows the city to move forward in a more efficient manner, continuing to make the types of adjustments necessary to regain structural balance,” S&P credit analyst Jane Hudson Ridley said in a statement. Standard & Poor’s, banks responsible for “predatory lending” to Detroit.. Here Joe O’Keefe of Fitch Ratings and Stephen Murphy of Standard and Poor;s (center) press UBS $1.5 billion debt on City Council Jan. 31, 2004. Meanwhile, however, S&P is keeping Detroit’s general obligation debt at junk level, citing budget deficits, cash-flow problems, and long-term liabilities including pension and retiree health benefits. Amazingly, they also mentioned potential payments on interest rate swaps. Ironically, keeping Detroit’s ratings downgraded provides more interest for the banks on new loans. 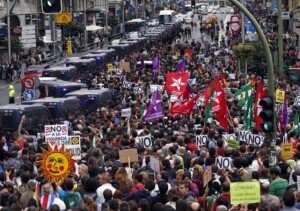 Millions protest bank-imposed austerity measures in Spain. Representatives of S&P and Fitch Ratings pressed for the UBS AG $1.5 billion POC loan at the City Council table in 2004, despite objections from residents, pension board and union leaders that the loan represented tremendous risk if the market “went south,” as it indeed did in 2008. For history of the disastrous $1.5 billion pension bond deal, written largely by this author in the pages of the Michigan Citizen, click on Pension bond stories MC.